Solid Steel Frame Hi Riser Set. 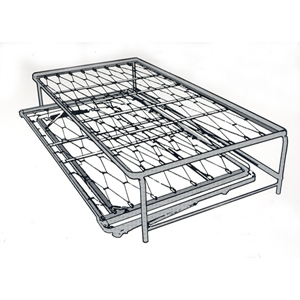 Price includes Frame and Pop Up Trundle with Wheels. Available In Four Sizes: 3FT.3 IN. x 75 IN., 2 Ft. 9 IN. x 75 In., And 2 FT. 6 IN. x 75 IN. And Extra Long 3FT. 3 In. x 80 IN. Long. No Assembly Required. Comes completely assembled. Convenient, store- able sleeping surfaces designed for long life and safety. Can Also Be Made In Custom Sizes. Please Call For A Quote.